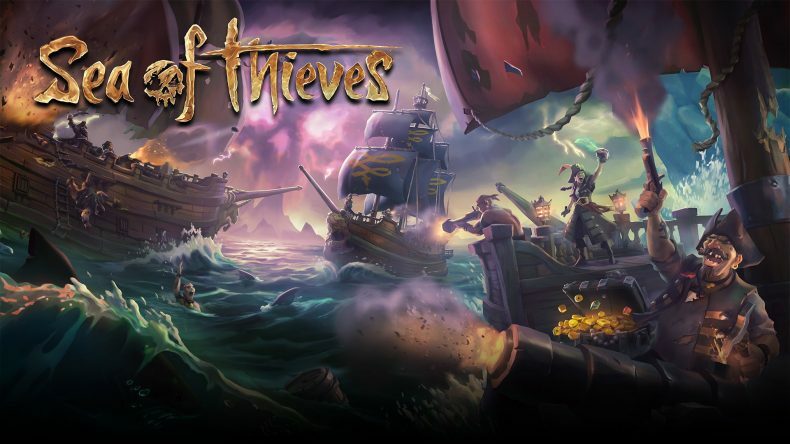 Sea of Thieves is a unique title. An incredibly ambitious project from the veteran British studio, Rare and a huge risk for Microsoft Studios, which has in the past tended to stick with the tried and tested games from its first party developers. It is a game that is like no other that I can think of. At times it is a beautiful, contemplative experience, at others a riot of laughter, and sometimes an exercise in frustration and annoyance. It feels like a game absolutely brimming with potential, but scratch the surface and it is evident that it is also a game that is sorely lacking any meaningful guided content for players to get stuck in to. At its heart, it’s a vehicle within which players create their own stories. It is a free form, pirate adventure game with very little direction and guidance on how to play, and much of my enjoyment has come from just sailing about and role-playing the life of a pirate on the high seas. If making up your own fun seems like too much at times, there is some direction in the form of three factions that you can perform tasks or ‘voyages’ for. These tasks are basically fetch quests, but once you level up your reputation with them they begin to include a little more problem solving and observation in order to complete. 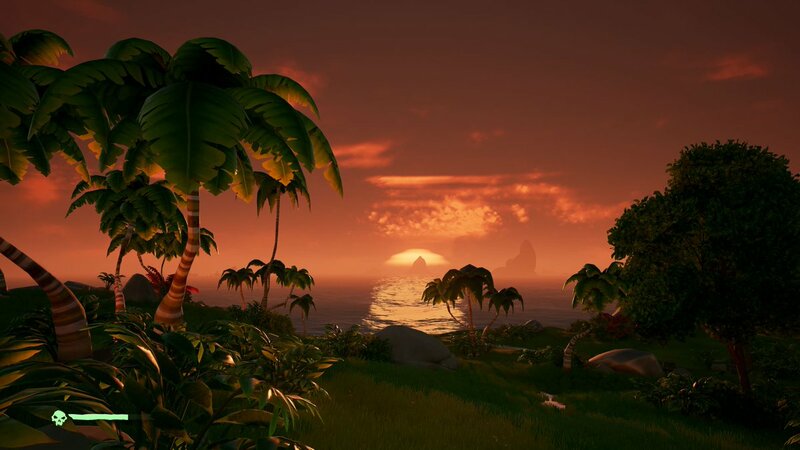 The Gold Hoarders sees you travelling across the seas to an island that you have a map for. Once there you need to observe the topography of the island and make your way to the spot on the map that has a big X marking the spot. You then dig up the treasure and return it to Gold Hoarders representative at any outpost for some gold and a bump in your reputation. The Order of the Souls has you fighting hordes of skeletons to get to a boss skeleton that you must take out and bring back the cursed skull for gold and a reputation boost, and finally the Merchant Alliance sees you carrying freight to specific outposts by a certain date and time. As you progress with each faction you can begin to unlock more complex and detailed quests that will see you visiting several islands before the voyage is complete. The Gold Hoarders (for example) sees you solving riddles to find the correct location on an island to dig up a map to another area. Once you have amassed a decent amount of gold you can spend it on a variety of customisation options to make your pirate and boat look different. The quests themselves are entertaining enough, but it is the journey to the specific islands where the game excels. 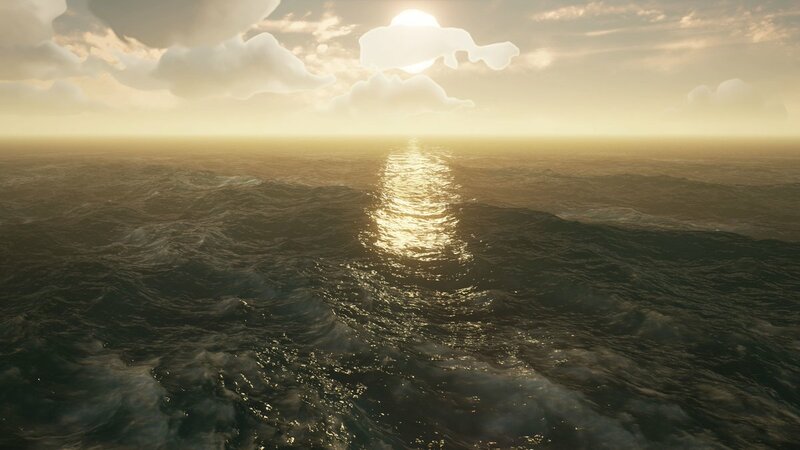 The art direction and sound design in Sea of Thieves is excellent, but the real star is the sea itself: it is extraordinary. Out on the waves the water feels alive. Your boat creaks and groans as the waves crash against it, little pools of water slosh around on your deck, and the sails whoosh as you turn them into the wind. Out at sea, spray can be seen coming off the crest of a wave, and the resultant splash heard as it hits your deck. On a clear day light dances across the surface and underneath the waves to give the ocean depth and movement. When the sea is calm it takes on an inviting turquoise blue, but pilot your craft into a storm and the waves roil and smash your boat around so much it is hard to steer, the wheel and compass spinning wildly as you are lifted high on a huge wave, and left to come crashing down once it has passed. On the horizon where a weather front is forming, clouds loom ominously close to the water and look heavy with rain, while flashes of lightning crack and fizzle. The level of detail is astonishing in a game that largely has a fun, cartoonish aesthetic to it. Sailing can be carried out solo on a sloop or in a crew of up to four on a galleon. The act of sailing requires a weighty process: the anchor must be lifted, the sails lowered and twisted to make best use of the wind and the wheel must be manned. There is no mini-map to guide you where you going, you get your orientation from your compass, the huge map table in the captain’s quarters that must be interrogated, and from observing the world around you. On your own this is manageable, but you are doing everything, in a crew of four individual tasks can be divvied out – one steering, one trimming the sails, one in the crow’s next scanning the horizon for other ships and one at the map table calling out directions. When each constituent part works together it is a glorious experience, and then you meet another crew. How you handle these meetings with other pirate crews is entirely down to your luck and, to a certain extent, your feelings on the game as a whole. There is huge potential for crews to grief other players which is an issue, and something Rare has already acknowledged, but they can also be exhilarating. The other crew still has to do all the same things to keep their ship moving and afloat and the simple act of lining up your boat in order to get a good cannon shot on your opponents broadside is a feat in itself. Proximity chat opens up the experience to a tirade of grief, but also some good natured baiting. Some of the best moments I have had with the game has been during these moments of other player interactions. In solo play I was griefed by two players from a four man crew who thought it would be funny to steal my boat. As I watched them from the shore sailing off, I scuttled my ship and stood there serenading them with the strains of my accordion as they sank, leaving them with a long swim back. Once they got back, one tried to kill me, but I got a killer blow with my cutlass then swam off laughing to myself, happy that I had out witted them and spawned another boat and set sail again. A message came via Xbox Live from another player in their crew apologising for their behaviour. Another example is when I was in a crew of two. We had been gathering loot from a variety of quests and our hull was laden with goodies. As we were about to set sail for the outpost, another ship came from nowhere and fired at us. Fortunately they missed and a twenty minute chase across the map ensued to escape them and get our spoils cashed in. It was terrifying, but at the same time it was one of the most exciting moments I’ve had in a multiplayer game in a long time. Sea of Thieves is a game of stories like these, some positive, some negative. 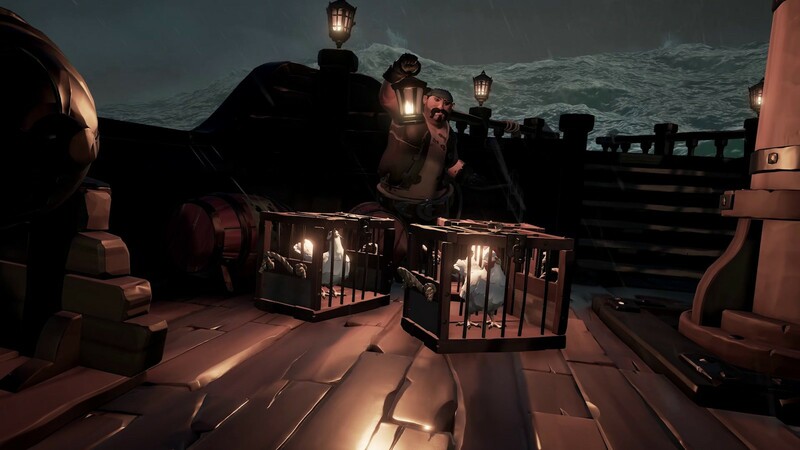 There is an underlying feeling that Rare has created something magical, a game like no other, and one that seems supremely confident in its systems. There is a joy to be had in just pottering around in the world, soaking up the atmosphere, but there is no escaping that for players where just existing within the world isn’t enough there is very little to keep them entertained passed the first few hours of enjoyment at playing something new. The lack of progression will put some people off, and the absence of things to guide you into creating the stories that the game will thrive on could be an issue if Rare does not have a roadmap for more content as time moves on. For now though, I can’t wait to get back into it and soak up everything it has to offer. A game brimming with potential. Incredible attention to detail and the potential to create your own stories is tempered somewhat by a lack of guided content to keep players motivated.